The 2002-2003 season brought much optimism for the club following their impressive first year in the Football League. Marcus Bignot, a former Crewe player was brought in to strengthen the squad and the club made an impressive start, losing only one game from their opening eight encounters. 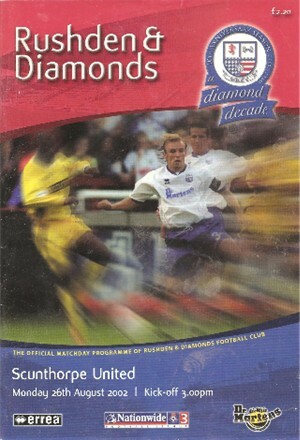 Despite an 8-0 loss to Coventry in the Worthington Cup (breaking the record for the heaviest club defeat) Diamonds were never out of the top six throughout 2002. A 5-1 home win over Shrewsbury kicked off 2003 and important victories over Kidderminster, Cambridge and Bournemouth kept the momentum going. On March 1st 2003, Diamonds were in second place in the table, a massive 12 points behind leaders Hartlepool, and at that stage there was no talk of the title. However, an incredible turn of fortunes for both sides resulted in one of the most amazing finishes to the season. With Hartlepool struggling to find any form, Diamonds took full advantage and in March the club racked up wins over York, Hull, Bury and Exeter, with Brian being named Manager of the Month (his second award of this type for the season). Diamonds won four important games on the trot in April, including a 2-1 victory over Carlisle, which secured promotion and could have secured the championship in the penultimate match of the season, but a 0-0 draw against Leyton Orient combined with a Hartlepool win set up a mouth-watering end of season game. The computer fixture could not have written the script any sweeter – Hartlepool were the last day opponents for Diamonds at Nene Park. The home side knew a draw would be good enough to secure the title and Paul Hall settled nerves with a first-half opener. It looked as though there would be no response from Hartlepool but with minutes remaining Diamonds fans were to endure nail-biting moments when Hartlepool grabbed an equaliser. However, this was to be Diamonds day as they held on for a famous draw to secure the championship in only the club’s second season in the Football League. This meant the Diamonds had secured their second national league title in their short existence, something other clubs may struggle to ever achieve, and certainly not in the current millennium. The game at home to Oxford United on 28th December 2002 was the 600th in the Diamonds History – see here for a reflection on that milestone. See below for a match summary as well as links to match reports. The final league table for the season can be seen here. See here for a detailed summary of all the games during the season, including team-line up for each game and match timings. Note – those games with a (P) in the scorers column will have match photos in the report, and those with a (V) will have a link to video highlights of the game.